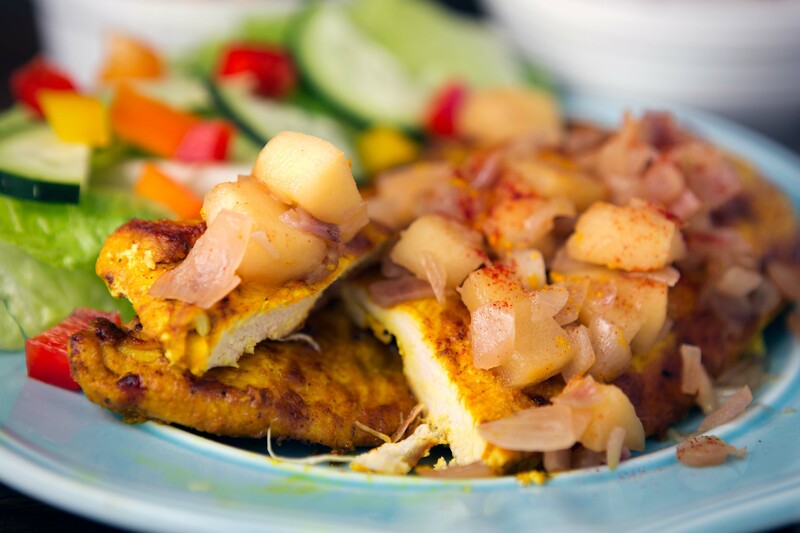 Thin, marinated breasts of turmeric covered chicken, topped with a mountain of mouthwatering, sweet apples and caramelized shallots. 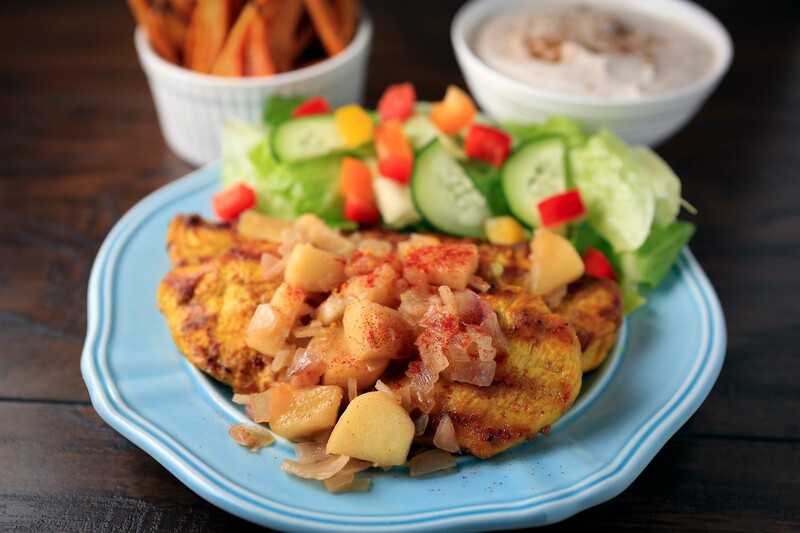 Serve Chicken Breasts with Turmeric, Apples and Shallots with rice, your favorite veggie or a side salad and you’ll have the perfect “good for you” meal that will certainly be an unforgettable family favorite. I’ve been having such a blast creating all sorts of healthy and delicious recipes. OBSESSED might be the right word, but I’d prefer to stick with something a little less dramatic. Let’s just say that I have been on a total role lately, in the creating and cooking department. Lots and lots of fun goodies have been emerging from our kitchen these days. I will most definitely be sharing the winning recipes with you! So don’t even worry. Ok, so more about this little creation. William was super excited about this dinner before I even made it! While we were out grocery shopping the other day, and busy gathering a few necessary ingredients, he exclaims, “Momma, I’m REALLY excited about that apple thing for dinner!” Well, if that doesn’t sell it, I don’t know what does. 😉 Clearly, this has become an instant family favorite! 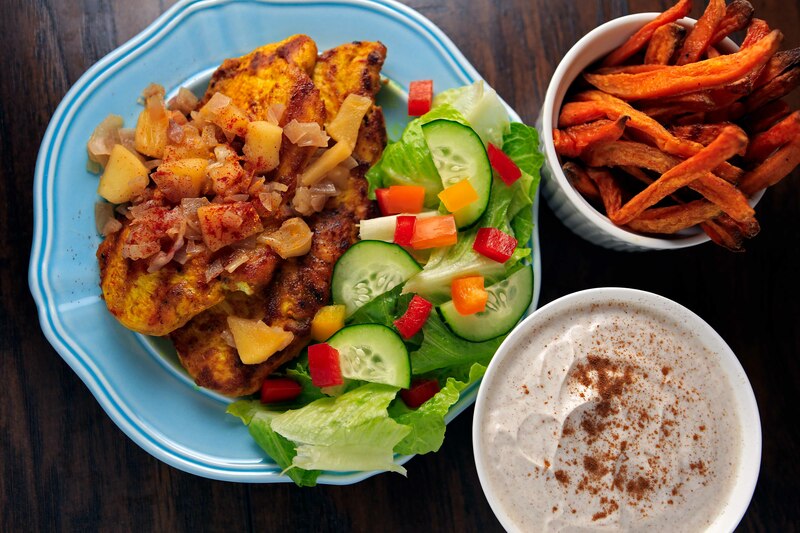 It’s sweet and savory, super easy, incredibly healthy, and just so yummy! I hope you enjoy it as much as we do. Slice chicken breasts in half, to create 8 thin breasts. Place chicken in gallon ziplock bag, and add 1 tablespoon of the oil and shake to coat. In a small bowl, stir together the turmeric, onion powder, garlic powder, 1/2 teaspoon salt and pepper. Add spice mixture to chicken. Close bag and shake again to evenly coat the chicken. Place ziplock bag on a clean plate and refrigerate for 2-6 hours. Cook chicken breasts on grill or in a grill pan on the stove. Make sure to spray grilling surface with nonstick cooking spray before adding chicken. (If using a pan, grill in two batches to avoid overcrowding.) Remove cooked chicken from grilling surface to a clean plate, and cover with foil to keep warm. In a large, nonstick saute pan, over medium heat, add the remaining tablespoon of oil. When oil is almost shimmering, add the shallots and apples. Cook for about 5 minutes until apples and shallots are softened a bit. Then stir in the honey, 1/4 teaspoon salt, 1/4 cup water and 2 tablespoons vinegar. Cook for 10-15 minutes until apples and shallots start to caramelize and are softened. Then add the remaining 1/2 cup water and 2 tablespoons vinegar and stir together for about 20 seconds to loosen the sauce. Remove from heat, and season with salt and pepper to taste. Spoon over chicken breasts and enjoy!